A pretty young woman wearing a dark beaded sleeveless dress and a choker poses for her portrait at the Rugg studio in Minneapolis, Minnesota. Arthur Rugg took a profile view of this woman and managed to capture her sweetness, evidenced in her eyes and smile. Mr. Rugg is not a stranger to the cabinet card gallery and you can view more of his images and learn more about him by clicking the category “Photographer: Rugg”. 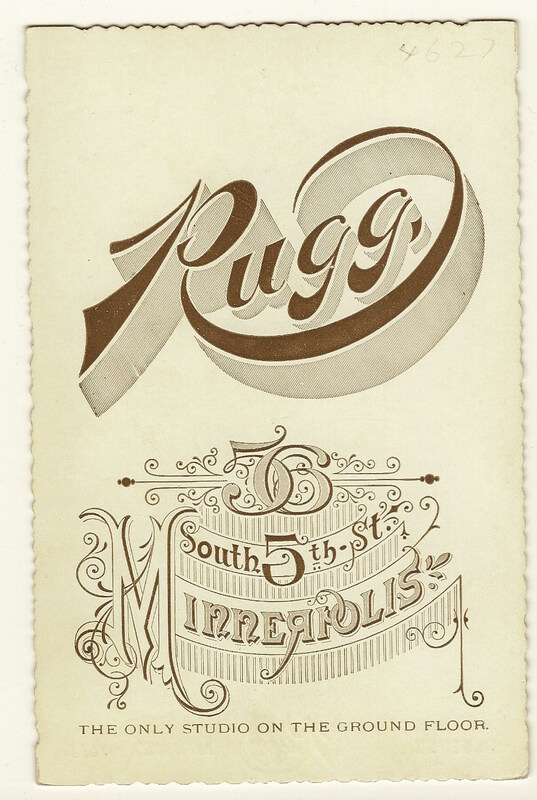 Below, you can see Mr. Rugg’s advertising which appeared on the reverse of the photograph. 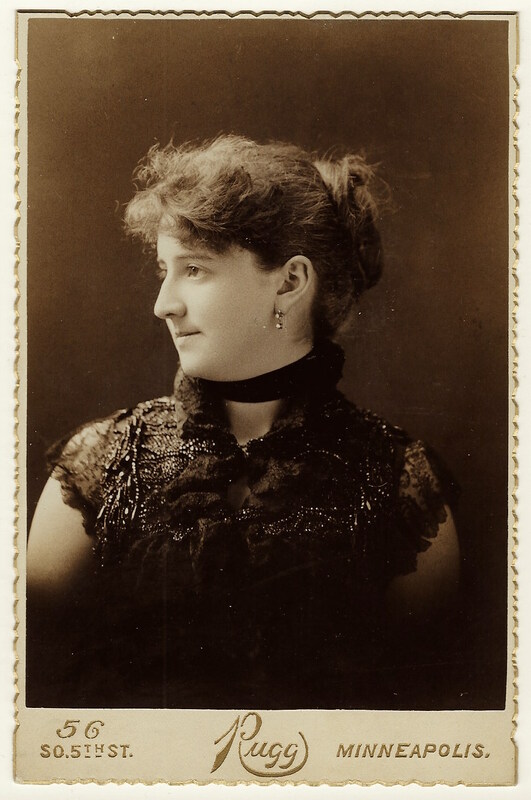 This cabinet card portrait features a young nicely dressed woman wearing a tintype pin or brooch. The jewelry holds a photograph of a train conductor; presumably the woman’s husband or suitor. 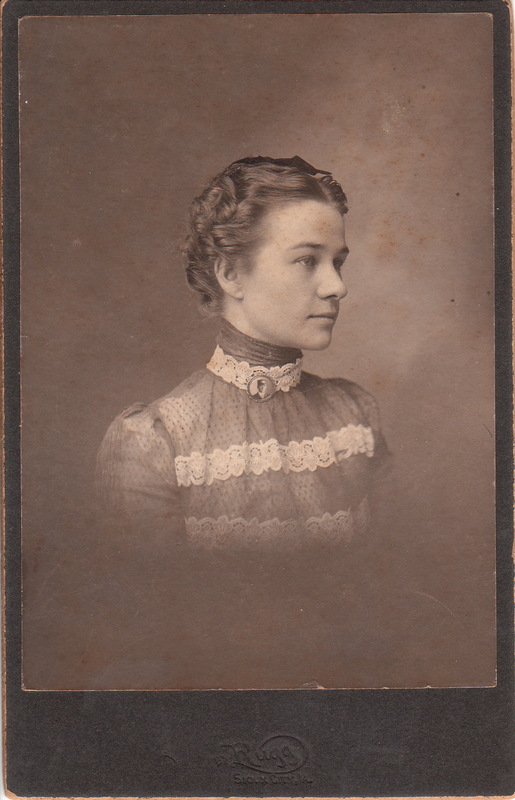 The cabinet card was photographed by Rugg, whose studio was located in Sioux City, Iowa. Research reveals little to assist in gathering information about Rugg. Investigation found that there was an artist that resided in Sioux City named Elliott I. Rugg (1862-?). There is a reasonable possibility that he is the photographer that produced this image. Elliott Rugg was a relative of another photographer, Arthur Rugg, who operated out of Minneapolis, Minnesota. To view photographs by Arthur Rugg, click on category “Photographer: Arthur Rugg”. An elderly man poses for his portrait at the studio of Arthur Rugg in Minneapolis, Minnesota. The man has a very distinguished appearance. 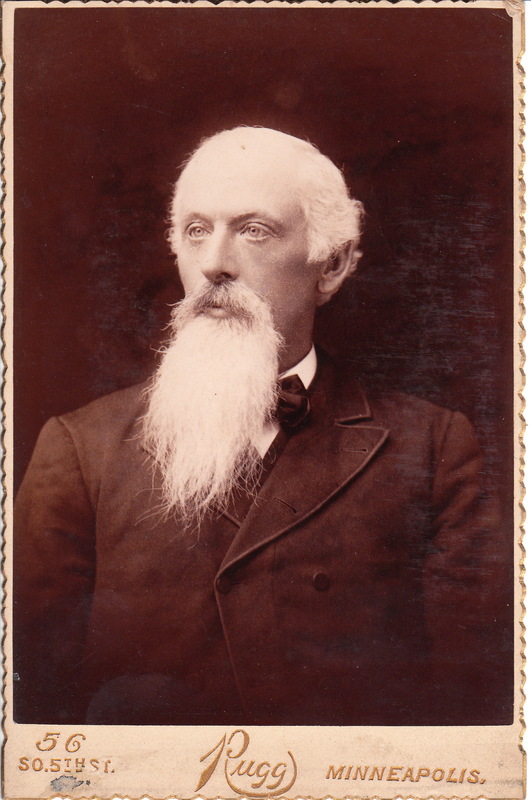 His long grey goatee is his entry ticket into cabinet card gallery’s category “Beards (Only the Best)”. To view other photographs by Rugg, and learn of his unethical behavior as a photographer, click on the category “Photographer: Rugg”. 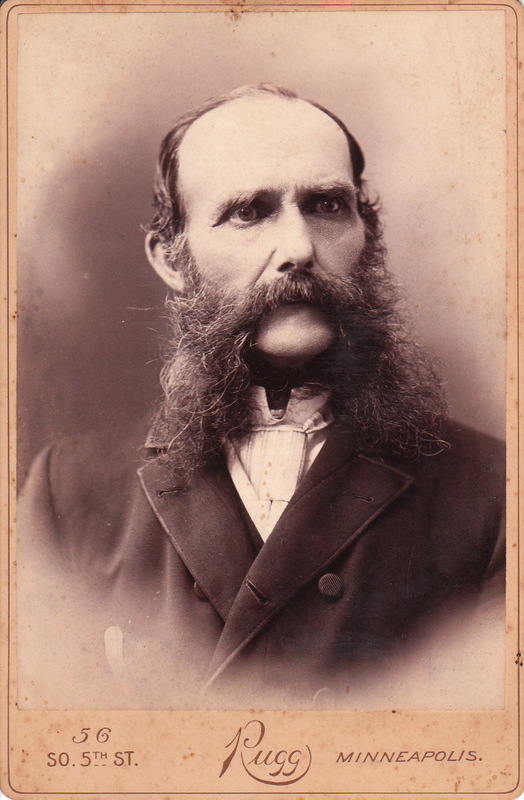 This cabinet card features a gentleman with a very notable mustache and bushy sideburns. He looks like a very intense man as he stares at the camera. The man behind the camera was Arthur B. Rugg (1853-?). Rugg’s life story is likely similar to many men who pursued the occupation of photographer. Such a life requires much change; first, working for various photographers in various locations, and finally, making enough money to finance ones own gallery. Rugg, at age 17, was an apprentice to J. C. Moulten of Fitchburg, Massachusetts. Moulton took ill just three weeks after Rugg began his apprenticeship and Rugg was forced to be a quick learner. He operated the gallery by himself and at night consulted with Moulten in his sick chamber , receiving criticisms and instructions. Rugg operated the business on his own for three weeks and the business did not suffer with him at its helm. In 1873, Rugg opened his own gallery but it did not do well, so he moved to Boston and worked for a photographer there for the next two years. He then went to Florida to become an orange grower but he lost everything when the business failed. His next stop was New Orleans where he worked for W. W. Washburn in one of the city’s leading galleries. However, after contacting malaria, he was forced to move North and ended up in LaCrosse, Wisconsin where he worked for a year and a half for a leading studio there. 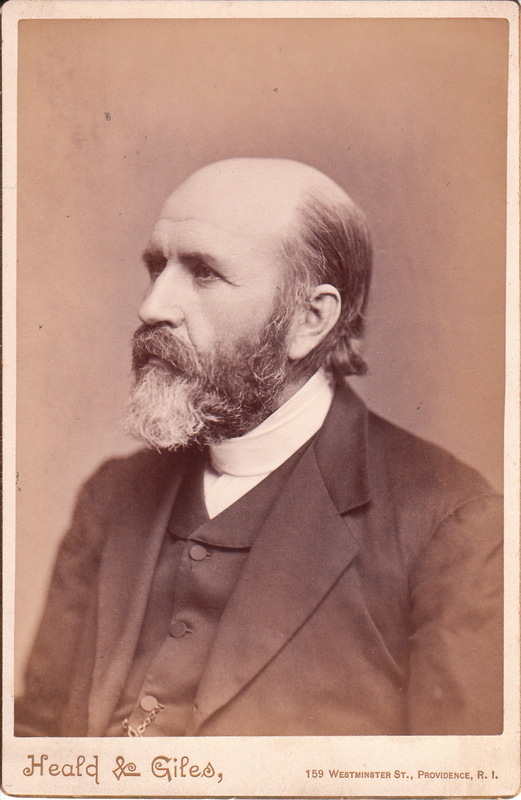 In 1879, he moved to Minneapolis and purchased the studio of William Brown and soon Rugg became one of the leading photographers of Minneapolis. Rugg was also noted for being involved in a major lawsuit that had impact on the profession of photography. The American Journal of Photography (1890) reported that the Supreme Court of Minnesota handed down a decision against Rugg for selling a copy of Mrs. Ida E. Moore’s photograph “which was put on exhibition in improper places, much to the discredit of the lady”. He was ruled to have had no right to the picture which legally belonged to the sitter (Ms. Moore). She won her suit for damages of five thousand dollars although it is not clear if that was the actual amount awarded. Another photography journal of that time reported more specifics of the case. It seems that Rugg had given one of Ms. Moore’s pictures to a police detective named Clark, who showed the photos in a number of houses of ill repute in the Minneapolis and St. Paul area. The court ruled that although the negatives of the photograph belonged to Rugg, he could not print photographs from those negatives without permission from Ms Moore. Mr Rugg seems to have lacked some ethics in this instance. Now, back to that great mustache. To view other photographs of unusual mustaches, click on Cabinet Card Gallery’s category of “Mustaches (Only the Best)”.